Every one of us wants to eat our bread fresh, right? However, there is nothing more tiresome than keeping the bread fresh. It becomes more hazardous if you have them in bulk. If you do not keep the bread in the right condition, fungus starts to grow and as a result, it gets wasted. Is not there any way to keep the bread fresh? Of course, there is. With a breadbox, you can easily keep your bread fresh and also protect it from fungal growth. Want to store big loafs of bread and keep it safe from the harsh environment outside? Then this Brabantia Breadbox is the suitable companion. This box has a massive internal storage capacity and it is the flat top design that allows accommodating more. 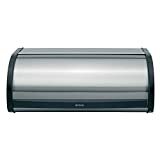 The roll lid is designed to perfection so that it doesn’t occupy any storage space. Highly durable and corrosion, you won’t find any unappealing fingerprint marks as it has a fingerprint-proof finish. 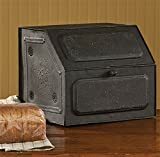 If you are a fan of retro or antique pieces, then this bread box from Park Designs is just what you need. 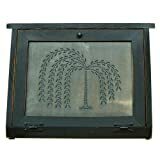 The distressed black gives an antique finish to the product and the carvings on the box are done precisely. It has two shelves thus have a huge space for storing in all the fresh bread. But to your surprise, it can be used as a desk organizer as well. Won’t it perfectly go with the interior of your beautifully decorated house? A product of the very famous chef Jamie Oliver, the bread box already ensures quality. It has a rustic and retro look and proves to be appropriate for a house with a rustic setting. The wooden lid can be also utilized as a breadboard and the storage bin is manufactured of superior quality carbon steel. Plus, the lid has a grooved underside that helps the lid to stay in place. The detailing done in sky-blue colour on a cream base gives a vintage vibe. Remember, it does have stainless steel detailing. Wesco Grandy being a well-known brand manufactures the best bread or storage boxes. The classic white finish of the box appeals to one’s eyes and to prevent from rusting, it has power coated sheet steel of high-quality. Besides having curved edges and enough space to fit pieces of bread, it has ventilation holes that keep bread safe and fresh. For better usage, it comes with a metal handle. 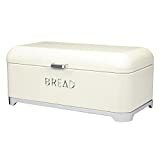 Your modern home decor needs this bread box for adding to the classiness. This 18/10 stainless steel product from WMF provides enough storage space and the contemporary design will just win your heart. 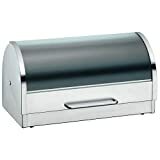 The barrel-shaped bread box has a roll-top lid which is made of frosted opaque glass. And to provide stability to the bread box, it is equipped with rubber feet. A dream product, isn’t it? Another product from Wesco Grandy, the retro look of this product will match your vintage themed kitchen or home. High-quality power coated sheet steel is used and the ventilation holes facilitate easy air-circulation which also keeps the contents of the box fresh. Furthermore, you do not have to struggle with removing the dust or dirt as you can clean it easily with a damp cloth and dry it perfectly. Tupperware is a prominent name in the world for manufacturing the best kitchen and dining room utensils. So, there are no mistakes done by this giant company when the matter comes down to making quality kitchenware and this bread box is a testament. BreadSmart from Tupperware is recognised for top-notch preservation power as it keeps the bread and pastries safe. Plus, it also prevents the growth of fungus and protects from harmful foreign particles. Hence, slices of bread stay fresh for a longer period of time. The white box with black rims appeals a lot. It is redesigned to fit in the modern world and looks elegant. What else do you need? This product from Kitchen Craft is probably one of the stylish looking bread boxes available in the market. When classic white colour is combined with an elegant and modern design, wonder like this bread box is created. It is kept simple by just having the words ‘bread’ written on a white base. The bread box has an abundance of space to fit in the bread slices and it keeps the stored edibles safe from contamination. Moreover, it has four legs to provide support and to keep the bread box in place. It is the first bread box in the list that comes in the shape of a container. As the name suggests, this is perfect for storing flatbreads and the round shape gives quite a room for the pieces of bread. This SouvNear product is made of wood and thus maintains the hygiene level. Crafted beautifully and coloured to promote the traditional breadboxes, the flatbread box will be fit for every home or outdoor picnic sessions. The lid of the container comes with a knob so that you can open the box without much trouble. The best product on this list will surprise you. At first glance, you can’t even guess this to be a bread box. Extraordinary designs and premium finish, the wooden box has a willow tree carved on a metal base which is showcased at the front. It has two shelves that have appropriate space for the bread. Undoubtedly, this exclusive piece of art perfectly serves the purpose of keeping bread loaves or slices fresh from germs. Being hygienic and eating fresh food is essential for a healthy lifestyle. We need to store loaves or slices of bread in our daily life as it is an important part of our morning breakfast and sometimes lunch and dinner. To keep it fresh, choose your favourite bread box from the list and get going.